i believe in good oral health but flossing is one of those activities that is akin to nails on a chalkboard, Justin Bieber selfies and a sick child. in other words, i'm not a fan. 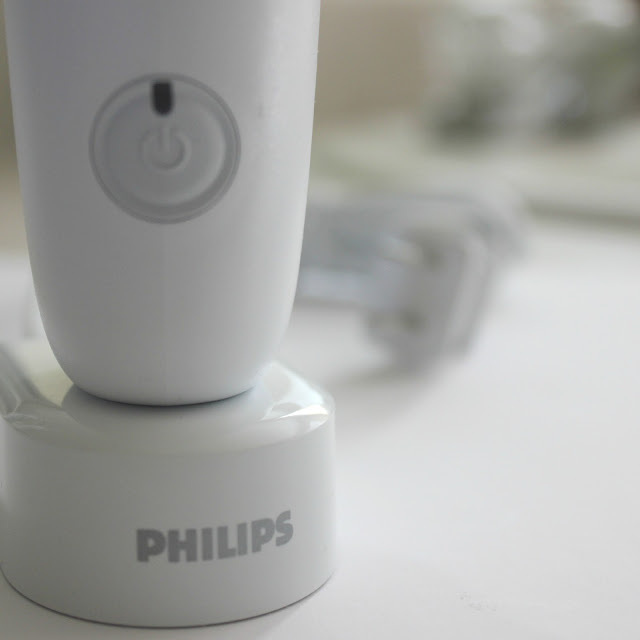 when Philips offered to send me their Sonicare AirFloss to try out i figured, why not? anything has to be better than Justin Bieber selfies flossing. i should have known i would like this product considering Sonicare toothbrushes have been taking up premium real estate on our bathroom countertop for the last 6 years. if i have to brush my teeth without my Sonicare my teeth are like the remains of a scratch lotto ticket, little fuzzies here and there. maybe i have become a little too dependent on that sonic technology? 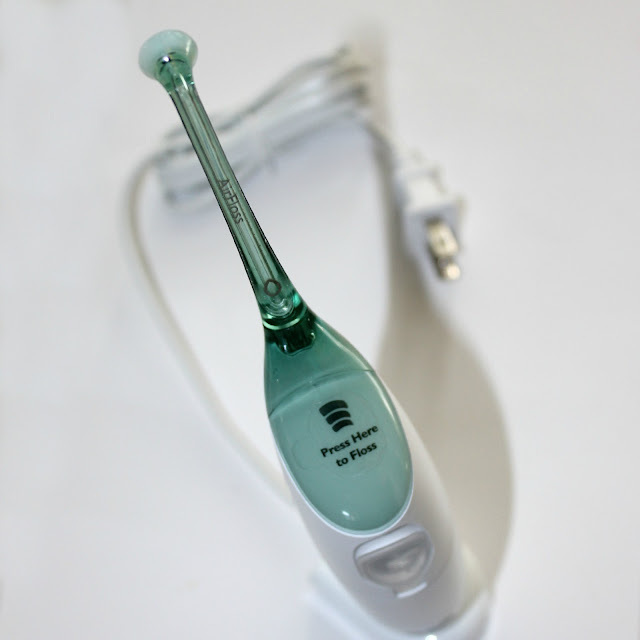 the Sonicare AirFloss has a body size similar to the Sonicare toothbrush. 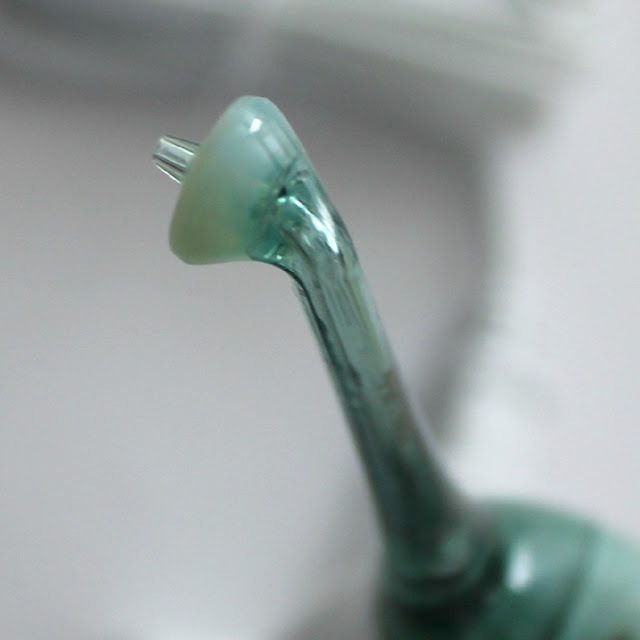 instead of a small bristled head, you get a snap shaped tip that shoots a combination of air and water. the microburst technology removes 99% more plaque between teeth than brushing with a manual toothbrush (goodbye scratch-card fuzz). its small shape makes it comfortable to use and it is ridiculously faster and easier than manually flossing. just think, no more measuring out your floss, wrapping it around your finger until it turns blue from lack of circulation and no more awkwardly trying to reach those back molars. it is as easy as pushing a button, no blue fingers required. i have always been a little self conscious about my teeth. it is the one area that i have never been able to fix. as a child i fell out of my high chair and landed on my face which caused me to lose my top two teeth (which the dentist just simply pushed back in) and permanently 'bruise' my adult teeth. if you look closely you will see a yellow smudge on my bottom two front teeth. i've spent a lifetime explaining, 'no, that is not corn stuck on my teeth it is a bruise' and then explaining 'yes, teeth really can bruise, i am not making that up'. while i don't mind having a crooked chin when i smile, that yellow has always been an annoying reminder. to overcompensate i want to make sure my teeth are well taken care of because i would hate for people to think the yellow is due to bad hygiene. this Sonicare AirFloss makes taking care of my teeth so easy. the one downside of using this AirFloss is that it can get a little bit messy. typically when i floss i lean in close to the mirror to see what i am doing. the first time i used my AirFloss i picked it up, leaned into the mirror and pressed the floss button. my mirror was promptly met with a large splash of water from the microburst ricocheting off my teeth and onto the mirror. 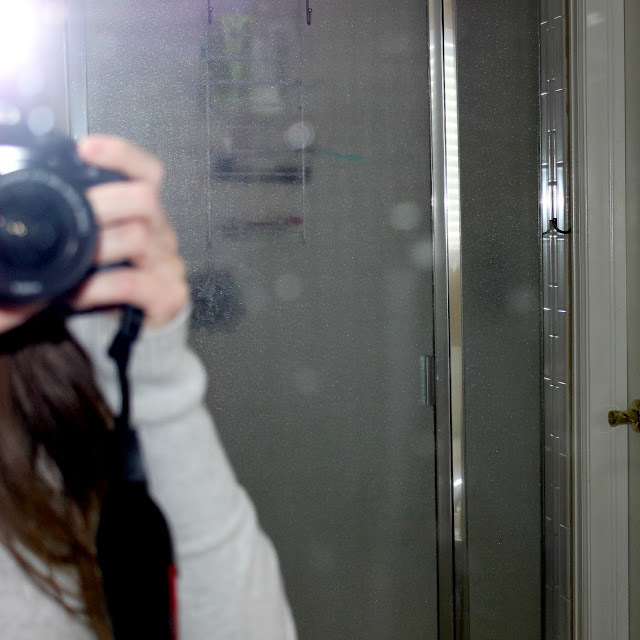 no, that is not a bokeh effect on my picture below, i was ineffectively trying to capture my mirror splash. word to the wise, close your mouth and don't lean in. that's advice that would be well received for many things in life, AirFloss included.